Back when fountain pens were the norm people used blotters to sop up the excess ink so it wouldn’t smear. Advertisers soon realized that they could easily place a message on one side of the blotter without any loss of utility. 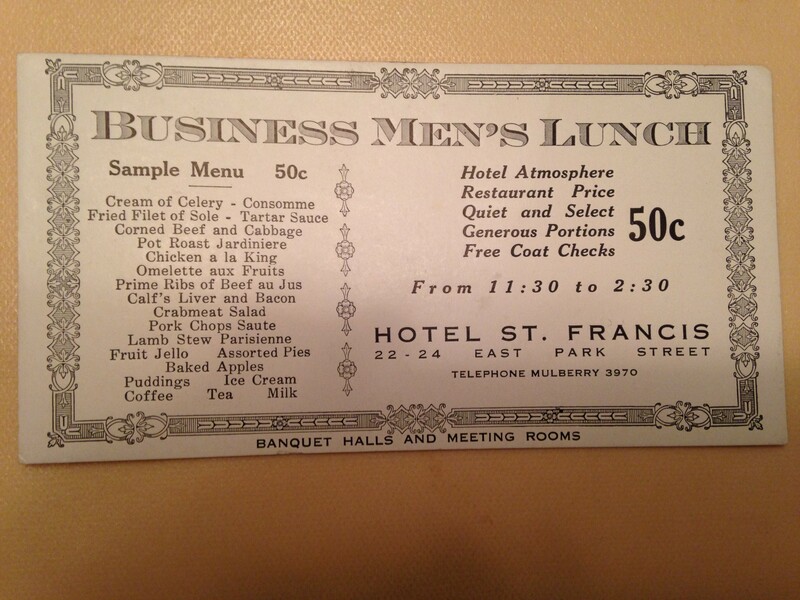 The blotter presented here advertises the Businessman’s Lunch at the very respectable St. Francis Hotel at 22-24 East park Street. The hotel finished in much reduced circumstances as the Carlton Hotel. It now sits stripped and vacant perhaps waiting for a new role in Newark’s downtown revival. The luncheon offered from 11:30 to 2:30 for 50 cents was quite extensive. I imagine 50 cents was a tidy sum at that time. Sounds like good eats. I called Mulberry 3970 for reservation’s but no answer.